Sam Geddis, Managing Director of Cornmarket Insurance Services, launches the 2018 Cornmarket Motorbike Awards with Glenn Irwin (left), Andrew Irwin (right) and Graeme Irwin. Motorbike-mad racing brothers Glenn, Andrew and Graeme Irwin have launched the 2018 Cornmarket Motorbike awards, which will be held once again at the Crowne Plaza Hotel in Belfast in January. All three will be major contenders for the prestigious Joey Dunlop trophy in the feature Irish Motorcyclist of the Year category at the star-studded bash in the New Year. Jonathan Rea can become the first person since Joey Dunlop (1983, '84, '85) to be crowned Irish Motorcyclist of the Year in three consecutive seasons. Reigning World Superbike champion Jonathan Rea will undoubtedly be the hot favourite to lift the famous silverware, when he can become the first person since Joey Dunlop to be crowned Irish Motorcyclist of the Year in three consecutive seasons. Five-time Formula 1 world champion Dunlop achieved the feat between 1983 and 1985, and Rea is right on course to match Joey’s treble. 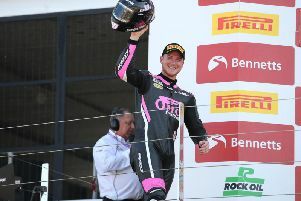 The factory Kawasaki star currently leads the World Superbike Championship by a commanding margin as he bids to become the first rider in history to win the title in three successive years. Once again the awards organisers have teamed up with the Enkalon Motorcycle Club to present the top award, which Rea has won for the last two years. His chief opposition includes the Irwin brothers from Carrickfergus, who have had a season to remember. Graeme was crowned British Motocross MX1 champion, while British Superbike rider Glenn won a memorable Superbike race at the North West 200, edging out Alastair Seeley in the blue riband showpiece. Younger brother Andrew has excelled in the British Supersport Championship with multiple podium finishes and it is surely only a matter of time before he claims his maiden win on the Gearlink Kawasaki. Glenn, who has confirmed his return to the Macau Grand Prix in November, said he is hoping for a memorable night for the Irwin family at the awards in January. “The standard of riders in this country, north and south, is pretty remarkable. We are really punching above or weight whether it’s in road racing, short circuit or off road,” he said. Andrew remains in the hunt for the British Supersport title and hasn’t given up hope of catching Clogher man Keith Farmer. Cornmarket Insurance Services Managing Director Sam Geddis said he was thrilled to be on board as the title sponsor of the awards once more. “As the chequered flag starts to come down on another fantastic motorcycle season during which riders have yet again excelled on the world and local scenes, we are thrilled to be supporting the awards. The Cornmarket Irish Motorcyclist of the Year is the longest standing motorcycle accolade, which is voted for by the public and an expert panel of judges, chaired by former British champion Adrian Coates. Tom Herron was the first recipient, while legendary names who followed suit include Joey Dunlop, Brian Reid, Phillip McCallen, Jeremy McWilliams, Eugene Laverty and Robert Dunlop. In all more than a dozen awards will be presented. The black tie event will welcome some of the biggest names in the sport and details of how to vote will be announced soon. Anyone wishing to purchase tickets can email tickets@bikeawards.co.uk or phone 07584058810. All details are also on Twitter using the handle @BikeAwards and the dedicated Facebook page Cornmarket Motorbike Awards.